This is a very simple one-pot dinner that only takes half an hour to make. You can adapt it to your own tastes by using whatever herbs and spices take your fancy – just use this as a base recipe and improvise. It’s also low-fat and well-balanced. What more could you ask? 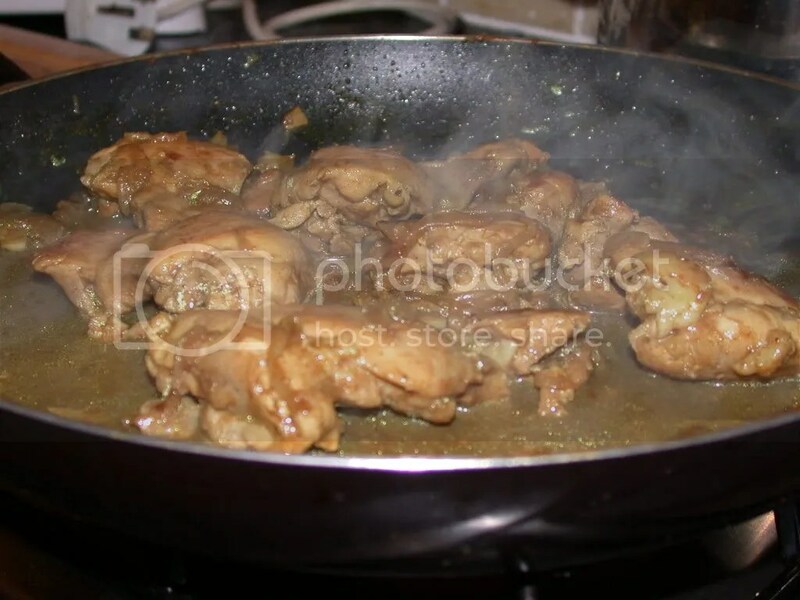 4 chicken pieces – drumsticks, thighs, or breasts (cube the breasts if you like). Basmati rice. I used a large mugfull for two people. 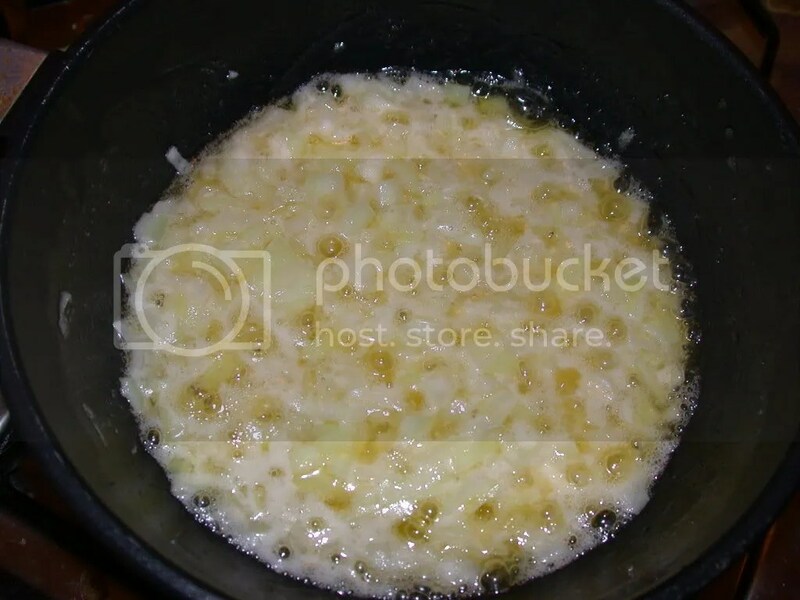 Chicken stock – twice the amount of rice, so I used two mugfulls. If you have fresh stock, use that. If not, a stock cube will do. Peas, frozen or fresh. However much you like. You need a wide-bottomed pan that has a lid. Heat up the oil and/or butter in the pan until it’s good and hot. Fry the chicken on all sides so they get some nice colouring – they don’t have to be cooked through, just a bit browned. Take chicken out of the pan and set it aside. Now add the onion and fry until it’s just turning golden. Add the garlic, fry for another minute and then add the rice and chicken. Give it a good stir for a minute or so, so that the rice absorbs all the juices, and then add the stock. If you’re adding herbs and/or spices, do so now. Tarragon, thyme, cumin, parsley and coriander would all work well (although not all at the same time. That would be madness). Turn the heat down, put the lid on the pan and leave it for 20 minutes. 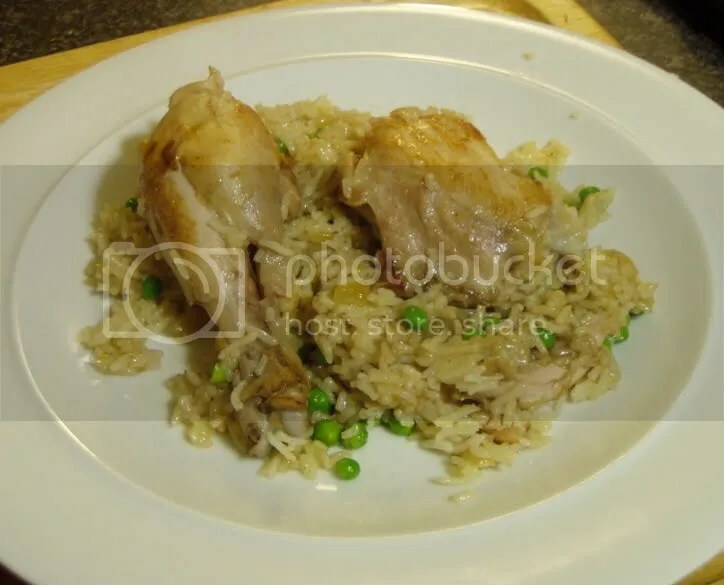 After 20 minutes the stock should be mostly absorbed and the rice and chicken cooked – check to make sure, and add the peas. Cook for another 3 or 4 minutes, have a taste and add salt if you think it needs it. That’s it! Serve it up and eat it. Very nice. I’m lucky enough that my other half, Alex B, is also a very good cook. There are certain dishes that I will always leave to him, simply because he has the knack of them and does them really well. Also, it means I don’t have to cook every night. 500ml chicken stock, more or less. Use the best you can get because it’s important in this dish. If you have home-made chicken stock, this is the perfect way of using it. Chop the onion and garlic and bacon into whatever sized pieces you would later like to eat. Chop or tear the chicken into small pieces. 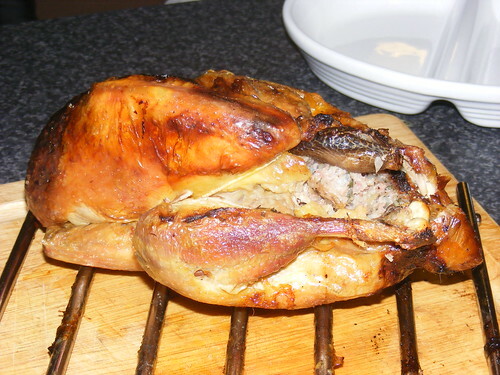 In this recipe I have used already cooked chicken, but you could also use raw chicken. Pour the stock into a saucepan and heat until just about simmering. Leave it on a low heat throughout the cooking. Heat the olive oil in a deep frying pan (some manufacturers call it a saute pan) and gently fry the bacon. (If you are using raw chicken fry this now too.) As the bacon is salty you will not need any other seasoning at this stage. When the bacon is mostly cooked remove it from the pan and put it on some kitchen roll. Add a little more olive oil to the pan and begin frying the onion gently. When the onion has softened nicely add the garlic for about a minute. After a minute add another drop of olive oil and a small knob of butter. When the butter has melted put the rice in and stir it around to coat it with oil and butter and cook for about 30 seconds. Pour in the white wine and stir. If the wine is cold you might want to turn the heat up to get it cooking quickly – you do not want your rice sitting around in cold liquid. When the wine had reduced to almost nothing begin the add the stock, one ladle-full at a time. You are now entering the main risotto-cooking process. This can take any time from 15 to 40 minutes, depending on the temperature you’ve got your hob. 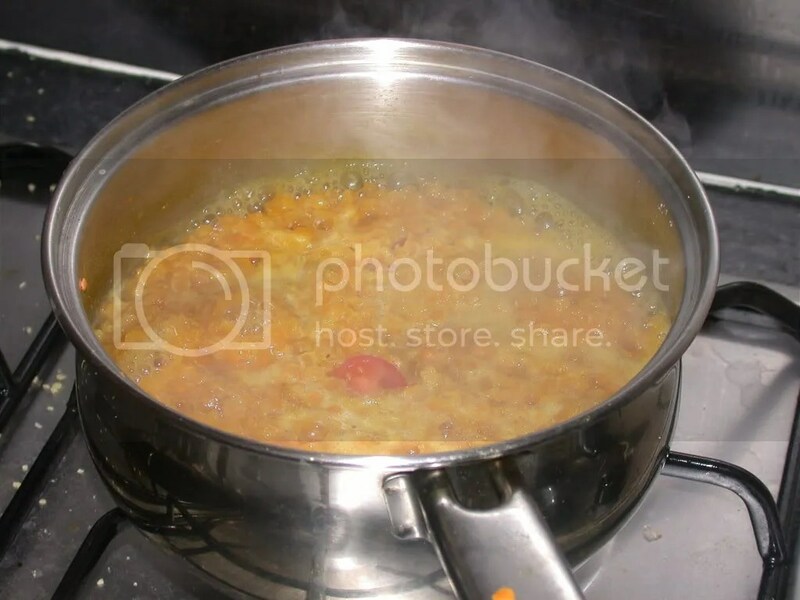 If the stock doesn’t bubble at all, then it’s not hot enough to cook the rice; if it is too hot then the stock will evaporate without pausing to cook the rice. When you’ve added the load of stock add any herbs you want. I used sage this time, but rosemary and thyme, or any combination of those three, would be good. Add your chicken and bacon now. Stir the risotto every so often to keep from sticking to the pan (except, see below). Allow the liquid to reduce until you have got a thick, sticky porridge kind of consistency and then add another ladle of stock. Don’t worry about using all the stock, the important thing is to get the rice cooked properly. Now: sticking. If you don’t stir the rice often enough, it will begin to stick to the bottom of the pan. Stir again and scrape any stuck rice off the pan. This is good, because it releases starch from the rice and helps to make the risotto all creamy and delicious. 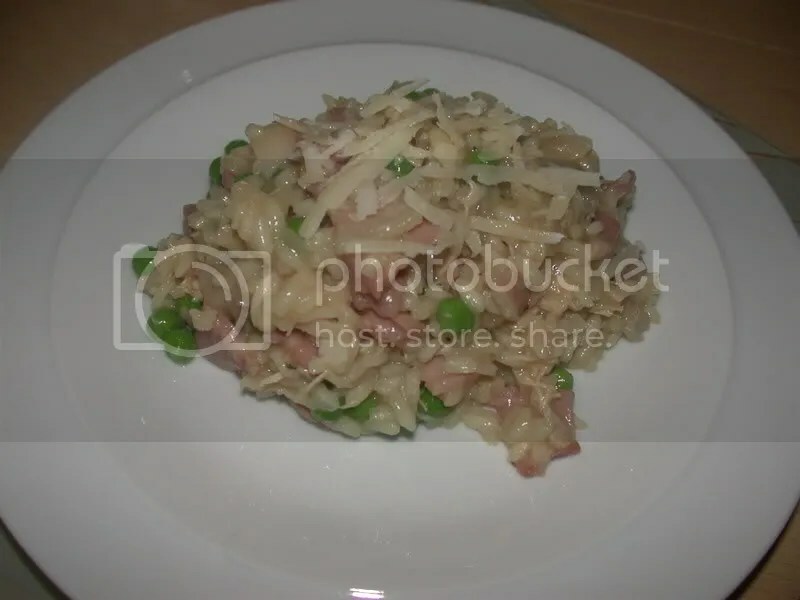 If the rice sticks too much it will form a sort of burnt layer underneath the risotto, but this doesn’t matter too much. Continue cooking, adding stock, and stirring, tasting the rice every so often. Risotto rice shouldn’t be as soft as basmati or other kinds of rice. There should still be a bit of bite in it, without actually being crunchy. When the rice is cooked to your taste, add the peas for about 2-3 minutes and turn the heat down. Use as many peas as you would like to eat. Turn the heat off completely and add the grated parmesan and stir it in. Sprinkle some more parmesan over the top if you are greedy (like us). Serve with some nice bread and salad. I recently acquired this chicken brick (for free! I love freecyle). 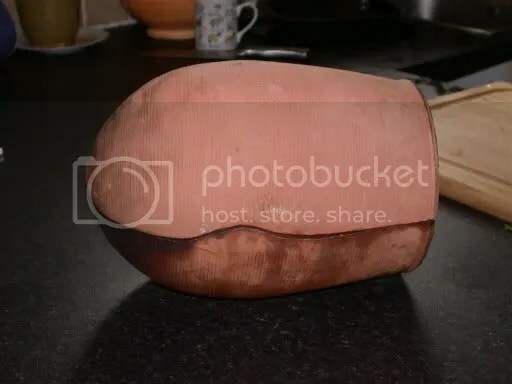 For those not in the know, a chicken brick is a clay pot into which you put a chicken and because of it’s shape and the fact that it’s a sealed environment, the chicken cooks lovely and moist. It takes longer than simply roasting a chicken on a roasting tray, but it’s worth it. Also, there’s no basting so you’re free to go off and do other things while it’s cooking. Apparently you can also cook all sorts of other things in a chicken brick – lamb, soup, casseroles. And why not? It’s just a pot, after all. I’ll let you know how I get on with my experiements. But first, the roast chicken. Serves 2 or 3, plus leftovers for sandwiches. First soak, the two halves of the chicken brick in water for about half an hour. This is important, it helps stop the pot cracking in the heat of the oven. Ignore the small sheep in the bobble hat there, he’s just trying to get in on the picture. He loves attention. Pop the veg into the bottom of the brick. If you haven’t got all the veg or want to use different varieties, go ahead. Put the lemon quarters, a couple of the bay leaves and the tarragon into the chicken cavity and then place it on top of the vegetables. Pour over the wine and water or chicken stock (I just used water. I think roast chicken is chickeny enough). Season with salt and pepper and put the top of the brick and put it in a COLD oven. Turn the oven on to 180/350/gas mark 5. Now, because you’re starting with a cold oven it’s going to take longer – about 2 to 2.5 hours. But because you’re not having to baste it every half an hour you can go and have a bath. Or to the pub. Or cook other things. Set aside the veg and chicken and keep warm while you make the gravy. Pour the juices from the brick into a saucepan. Have a smell, it’ll be lovely. Bring it up to a simmer and if you’re feeling cheffy, thicken it with a roux. If you’re not, simply mix a tablespoon of cornflour with a tablespoon of water and pour it into the gravy to thicken it. Simmer for a few more minutes and you’re done. Serve the chicken, veg and gravy, perhaps with a potato dish (perhaps boulangere potatoes). 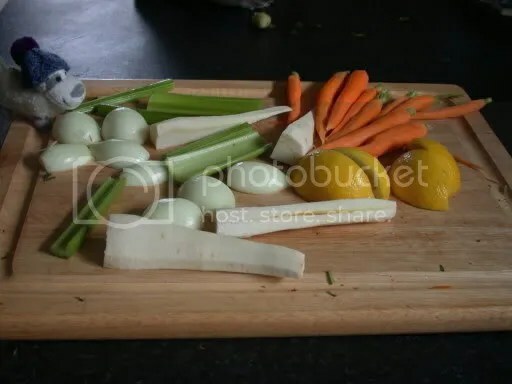 Don’t forget to make chicken stock with the chicken carcass. On reading other food/cookery blogs I’m seeing plates and bowls of good-looking food. And I wonder – who are these people who know how to cook so well, so prettily? I’m not a bad cook, I’d go so far as to say I’m growing into being a good one, but my meals are much more trial and error. It should also be taken into account that I am often a fool. Today, for example, I was making what was shaping up to be a pretty good chicken noodle soup with some stock I made yesterday. 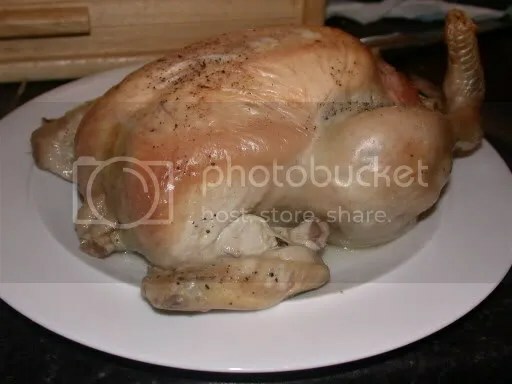 I had the leftover chicken from Sunday’s roast, I chucked it in the pot, and only then did I remember that I had flavoured the roast chicken with a lemon butter under the skin. The chicken noodle soup was… lemony. Really quite lemony. Which is not the flavour I was going for. As it turned out, Mr B enjoys lemony chicken noodle soup and the meal was not ruined, particularly with the addition of kneidl. But I never see this happen in other people’s blogs. Their food looks pretty, colourful, less accidental. And here’s another thing – sometimes it’s not me being a fool. I also had a go at making dashi (Japanese stock) today. From all the recipes I looked at, it looks pretty simple. Put kombu in water, bring to boil, add bonito flakes, turn off heat, when flakes settle at bottom of pan all is done. Except none of these recipes (NONE) mentioned that you need to poke the flakes to make them settle. I left those flakes floating on top the water of 20 minutes. “This can’t be right”, thought I, “I will investigate”. At which point I poked some flakes gently and they all immediately sunk to the bottom of the pan. I drained the stock, had a sip, and oh my lord it tasted like tuna water. It wasn’t good. I gave it the benefit of a doubt and tried it again. Nope. Definitely tuna water, caused by excessive bonito flake soaking. I threw it away. So you see. Sometimes I’m a culinary clever-clogs, some days (like today) I should just stick to stir-fry. This recipe is adapted from Leith’s Cookery Bible, the most-used book in my collection. I’ve been making it for several years now and I think I’ve got it pretty good. I differ from a lot of recipes in that I prefer the liver to be fairly well cooked because I just think it has a fuller flavour that way. I’ve prettied today’s version up by sticking some basil leaves in the ramekins. I haven’t done that before so maybe it’ll taste terrible, but I think it’ll be okay. Yes, it’s an awful lot of butter. But can you think of a dish that wasn’t improved by the addition of butter? I usually only make this starter for christmas or for guests that I like a lot. It’s rich, but it never fails to impress. 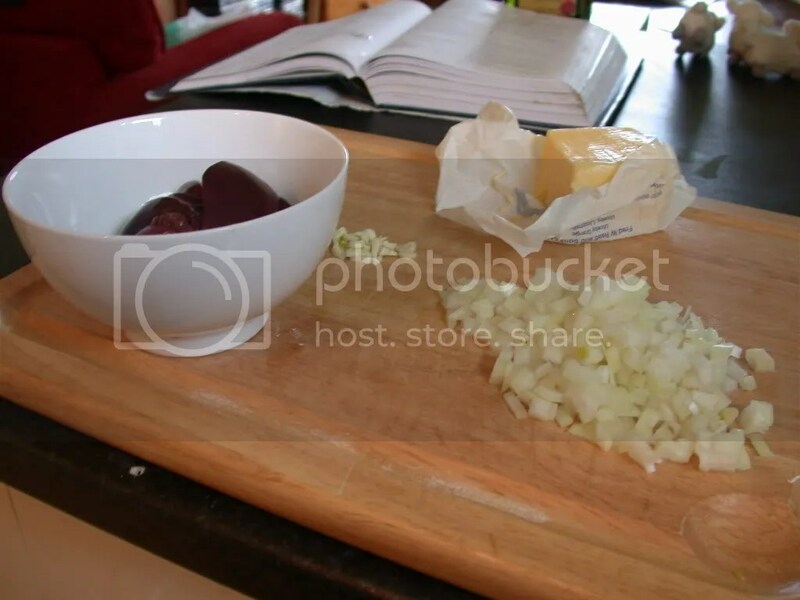 First, do your prep – chop the onions and garlic and wash the chicken livers. If there are any green bits, discard them. You add the garlic. Fry for one minute more. Now add the chicken livers. If you’ve had the heat on low so you don’t burn the onions and garlic, turn it up now – they won’t burn now. Brown the chicken livers on all sides. I’ve read recipes that tell me this should take 3 minutes. I’ve found that to get them to my liking takes about 10 minutes. Call me a heathen, I think it tastes more mature this way. Add salt and pepper as you like. Now comes the fun bit. Pour some brandy into a tablespoon and set it alight, either with a lighter or with the flame if you’re using a gas hob. Pour it over the livers. Do this again with another tablespoon. Cook for another couple of minutes to take the edge off the alcohol. Once it’s all done to your liking, take them off the heat and let them cool a bit. Once they’re cool enough, pour them into the blender and add the rest of the butter and the parsley. Blend for a good two or three minutes to get it nice and smooth. 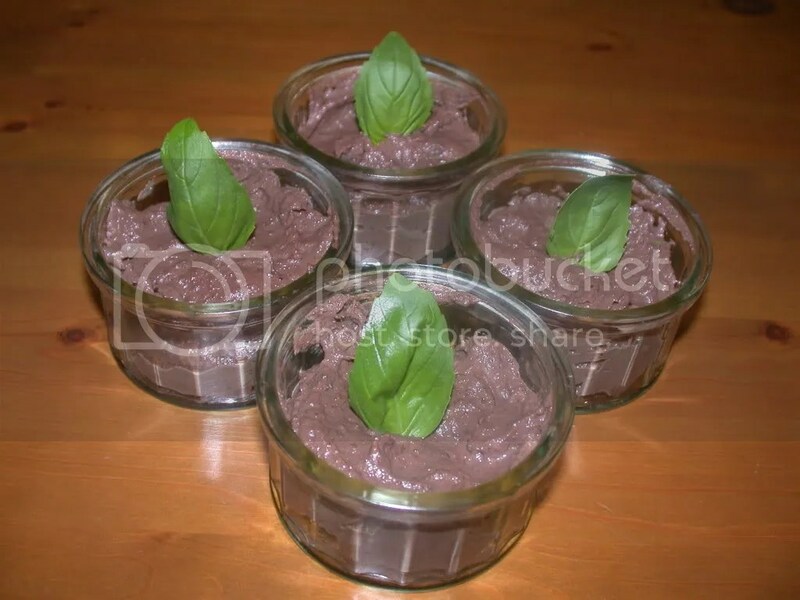 Depending on how you’re going to serve the pate, pour it into appropriate dishes. Today I used ramekins, usually I would use one big dish. Do let it cool before you eat it, the flavour gets more subtle as it cools. Serve wth big lumps of crusty bread. Recipe here. Of course I bought the almonds and coriander to garnish. I’m a sucker for unnecesary food purchases. I succummbed to my perennial failing – timing. The chicken was done well before the dhal and rice. BUT. It was, in the words of Mr B, “very good”. And coming from him, this is high praise. The recipe worked well, and the dhal was better than normal. 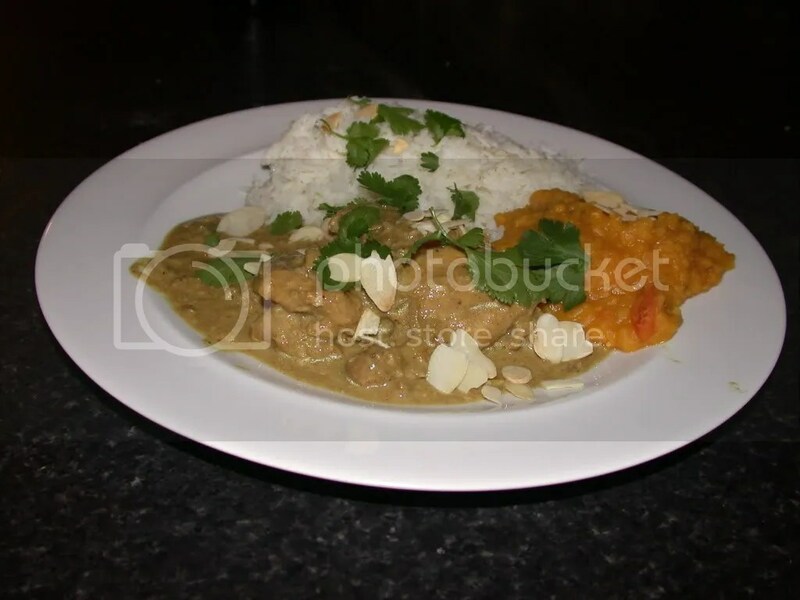 For next time, start the rice and dhal at the same time the chicken goes in the pan. Look at that. Steaming, bubbling turmeric lentils. I used Maldon sea salt to season, which always adds an edge. It’s not a great picture because pretty food isn’t my speciality, especially when it comes to Indian food. The creme fraiche was almost lemony in its tang. I’ll certainly make this again.